FANS OFFER: Do you want be part of a Posh squad photo? A Posh squad photo from the past! You can be part of the annual, pre-season Peterborough United first-team squad photograph. Club sponsors Mick George Ltd are offering one lucky Posh fan the chance to appear alongside the entire squad, management team and chairman, in the photo, to be taken at the ABAX Stadium on Monday, August 1. To register, please visit www.mickgeorge.co.uk/poshphoto and detail why you think your application would be suitable, before 12pm on Friday, July 29. 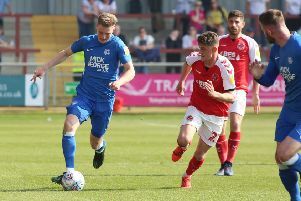 Please note that successful candidates will need to be available between 1.30pm-2.30pm on Monday and be dressed in the Peterborough United FC replica shirt. The lucky winner will be selected at random and informed before 5pm on Friday July, 29.